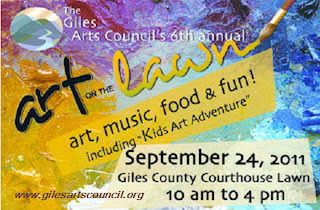 Genesis Photography: Giles County Art on The Lawn Show This Saturday! Giles County Art on The Lawn Show This Saturday! Hello everyone! I just wanted to make a little announcement! Genesis Photography will be at the Giles' Art Council's Annual Art on the Lawn Event at the Giles County Courthouse this Saturday September 24th from 10am - 4pm! This is juried art show and sale as well as a family friendly festival! There will be fun, games and events for the kids, live music, food, and lots of beautiful art. For more information visit: http://www.gilesartscouncil.org/ . Come see our newly decorated booth featuring framed landscape photos with calligraphy, unframed matted photos, and custom ordering options! The holiday season is right around the corner so stop by and get a jump on your shopping! See you there!